We have gathered a few frequently asked questions about Secret Sun Sea Salt for your convenience. Have a question we didn’t answer or need clarification? Please contact us. Is Your Salt Made In A Sustainable Way? We take pride in the fact that we naturally harvest our salt from the beautiful and pristine Laguna Ojo de Liebre in Baja California Sur, Mexico. This site is inscribed on the Unesco World Heritage list. Our harvesting process works in harmony with this delicate ecosystem, which also serves as a mating and breeding ground for the North Pacific Gray Whale. Our careful and balanced process honors the environment and ensures that we can continue to harvest salt for the foreseeable future. Where Is Your Salt Warehoused? We harvest our salt in Baja California Sur, Mexico and warehouse it in San Diego, California. The warehouse is located conveniently next to freight and rail lines, allowing us to respond quickly to orders for efficient shipping and pick-up. Learn more. How Much Salt Can I Order? We can accommodate orders of nearly any size. We enjoy a very large and stable supply of sea salt, which allows us to quickly adapt to large orders or rising demand. Our sea salt is available in 50lb bags, and can be made available in metric ton size totes. Contact us to discuss your specific needs. What Is Your Lead Order Time? Our initial lead order time is up to six weeks. Turnaround time will likely decrease after the first shipment has been completed. Unlike our competitors, we ship our salt entirely over land, which cuts down our lead time and makes the entire shipping process more efficient. Our warehouse is conveniently located near freight and rail lines. Learn more about our superior logistics. Is Your Salt US Food Grade? Yes, our salt is sifted and is US food grade. All plants are FSSC/GFSI and HACCP certified. Our product also meets the FDA’s Standard of Identity for sea salt. Please contact us for more information on our quality. Is Your Salt Organic And Non-GMO? Yes, Secret Sun Sea Salts are non-GMO and available organic (with alternate anti-caking agent). Contact us to learn more. Yes, Secret Sun Sea Salts are certified kosher. Contact us to see our kosher certificate. How Is Your Salt Made? Our patented sea salt harvesting process is unique among its competitors. We harness the sea, sun, and wind to create flavorful, pure, single-crystal sea salt. The harvesting process takes over two years from beginning to end and involves 13 gravity fed condensation ponds. As our salt travels through each pond, the different mineral brines and sun condensation and crystallization refine the quality and taste of the salt. Learn more about this special process. Our sea salt is sun harvested from the Laguna Ojo de Liebre in Baja California Sur, off the Pacific Ocean in Mexico. The lagoon is inscribed on the Unesco World Heritage list and is a mating and breeding ground for the North Pacific Gray Whale. It is also an important ecosystem for marine life and migratory birds. Our harvesting process is completely natural and does not harm the lagoon or its surrounding environment. Learn more about Laguna Ojo de Liebre and where Secret Sun Sea Salts come from. Which Secret Sun Sea Salts Are Best For Which Products? The best fit for your food recipes will depend on a variety of factors, including the level of sodium reduction required and the specific production process of the product. 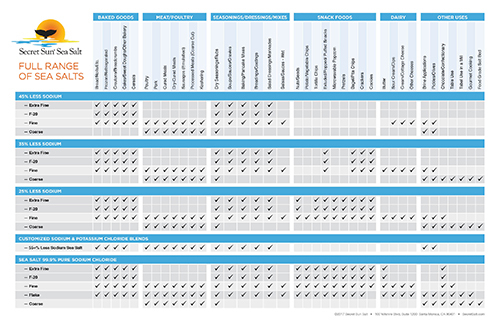 View our Product Application Chart for general guidance on which salt products we recommend for different food groups. You can also contact our knowledgeable team for personalized assistance. Do You Offer Sea Salt With More Than 45% Reduced Sodium or Blends With Potassium Chloride? Yes, we offer a 57% less sodium sea salt/potassium chloride blend, and we can create customized 50+% lower sodium blends with marine-sourced potassium chloride. These lower blends can help you drastically decrease the amount of sodium in your product and help consumers meet low sodium diets. Contact us to learn more. What Salt Products Do You Offer? We offer single-crystal sea salt at 99.9% sodium chloride purity in four grinds – coarse salt, fine grain, powder, and flake. Additionally, we offer four popular low sodium levels – 25% less sodium, 35% less sodium, 45% less sodium, and 57% less sodium. All low sodium options are available in fine grain and powder. Learn more about our product offerings by viewing our Product Application Chart.